Light Sport America was founded to manufacture and distribute light sport aircraft in the United States by J. Phil McCoy, a 38-year veteran of the general aviation industry. With some of the finest light sport aircraft in the world to offer, Light Sport America (LSA), is approaching the market with fresh ideas to compliment it's product line. McCoy has likened the early light sport aircraft market as something akin to the Old West, complete with gunslingers, riverboat gamblers, patent medicine hucksters, rustlers and everything in between. Early on, it wasn't unusual for manufacturers to promise 90-day deliveries that stretched to 18 months. Dealers would make outlandish claims about the airplanes they sold. It truly was like the Old West. McCoy and his team have brought new standards of experience and professionalism to the light sport market through Light Sport America. For example, instead of using dealers, LSA sells direct to customers through its network of independent factory representatives. We feel that this gives customers better service since our customers will basically be dealing directly with the factory, but just as important, it will save customers money by eliminating dealer commissions. But the differences don't stop there! LSA has built a professional marketing organization where service to the customer is the highest priority. It maintains professional lines of communication with its customers. For example, upon delivery of an aircraft, LSA takes the time to aid our customers in transitional training to assure they get the greatest satisfaction and utilization from their new aircraft. Best of all, plans are already on the table to assemble and manufacture all Storm aircraft right here in the United States. This means jobs for America. It also keeps costs lower, since our products won't incur ocean shipping charges and customs fees. It also eliminates long waits for parts and support. LSA offers six light sport models: The Rally, Rally Amphibious, Rally Surveillance, Century Tricycle, Century Ag, and Century Conventional. Soon to follow will be the DerringerGB, a low cost multi-engine trainer. 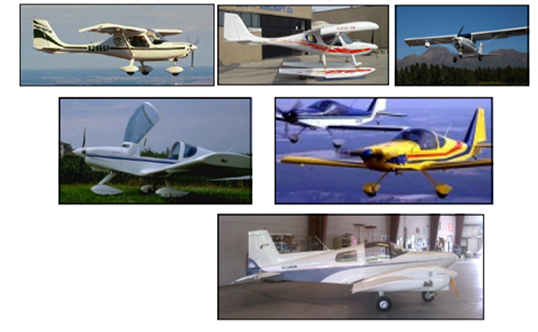 While most light sport manufacturers concentrate of aircraft sales, LSA offers it's customers complete, turnkey support including sales, service, financing, insurance and transitional training. Sadly, a unique concept in today's market—take care of the customer. J. Phil McCoy is a third generation aviator and began his career in general aviation in 1975. He has worked for such notable names as King Radio Corporation, Fairchild- Swearingen Aircraft, and Foster AirData Systems. He founded McCoy Avionics Corporation, took the company public and later sold his interests. Since 1997 he has worked as a consultant for such well known aviation companies as Ryan International Corporation, Sun Aviation, Houston Gulf Avionics, Eastern Avionics International, and Remos Aircraft. He knows the market and what customers expect. McCoy has built a strong management team of veterans in general aviation that assure continued high standards of professionalism in the light sport market.